These men are in khaki service dress with the early version of the Strathcona's Horse badge on their stetsons and collars. The badge was simply the arms of Lord Strathcona but without the title surrounding it. The jacket has 7 brass buttons down the front instead of the usual 5 and the chevrons are of gold lace. 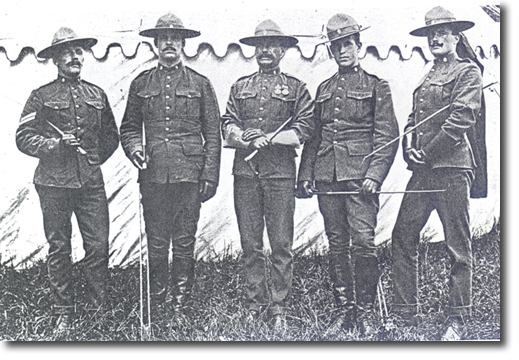 They all wear a medal ribbon for the North West Canada Medal 1885 except for the Staff Sergeant in the middle who wears the medal itself alongside the Queen's South Africa medal. This would suggest that either 4 of them had not received their medal at that point or else the four joined the regiment after the war. Two of them wear the Strathcona boots that became a feature of the North West Mounted Police. The others wear trousers. It is odd that two of those in trousers are wearing gauntlets while the other three wear short leather gloves.